DRAMs are short-term memories with a high speed, but the data must be refreshed over 100 times per second. Flash memory can store data for years without refreshing them, but it writes information about 1000 the following is a nanostructure based semiconductor non-volatile memory cell that can provide the best features of both DRAM and flash memory: long term storage with writing speeds nearly as fast as DRAM. 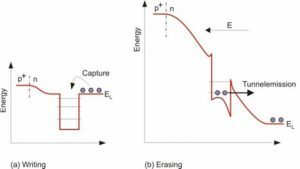 An important difference between normal flash memories and this new type of memory device is the possibility of varying the barrier height by changing the bias on the depletion region, thus enabling either the retention or the insertion of charge into the QD. A further difference is the possibility of growing the QDs in the depletion region of a p-n junction, so that holes are stored in the QDs. Charge removal is achieved by using tunneling. The read mechanism is similar to that of a flash memory.